By now, everybody should know just how dangerous it is to drive distracted. Texting or browsing on a phone is probably the most common and widely known form of distracted driving, but did you know that distracted driving actually includes any time your hands, eyes, or mind is taken off of driving? In fact, there are a lot of ways in which regular drivers are being distracted behind the wheel—all without even realizing. Here are some commonplace incidents of distracted driving, of which any of us could be guilty. Obviously siri and other similar hands free phone tools are useful, and good ways to prevent looking at a device while driving a car. However, even using such a service constitutes distracted driving, and should only be used in cases of emergency. If you don’t desperately need to find out who played Lando Calrissian in The Empire Strikes Back, then it can probably wait until you arrive at your destination (to save you some time, it was Billy Dee Williams). In a similar vein, while hands free phone calls are definitely preferable to text messages or holding a phone to your ear, they should also be avoided when possible. Your mind will be taken off of the task at hand—driving the car—and will thus prevent an less than ideal situation for yourself. 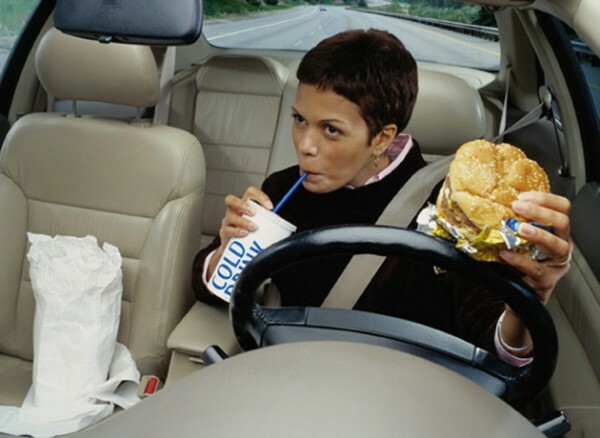 Consuming food or drink of any kind is definitely a form of distracted driving. To eat or drink something you have to take at least one hand from the wheel, and also possibly move your eyes from the road ahead. Whether it’s the air conditioning, the heating, the washer fluid, the mirrors—whatever it is, it should always be taken care of before you set off on the road. While such things are important for a safe and comfortable drive, they are not the kinds of things you should be looking at and adjusting—other than briefly—when behind the wheel. Just about everyone has a GPS built into their phone or other device nowadays, and they are good tools for finding where you need to go. But this is another thing that you should try to sort out before you leave your starting point. Spending too long looking at or adjusting your GPS could lead to an accident on the road. Driving can be a good time to think about things. But too much overanalysis and you can soon lose track of the decisions you need to be making on the road. Try to leave your troubles behind when you get behind the wheel. As with adjusting other car controls, changing the music can be very distracting. While skipping a song or quickly changing radio stations is no problem, if you are searching for that perfect tune or seeking out a specific station, you are going to run into trouble. Try to sort out your music before you hit the road. There is a time and a place for applying chapstick— or any kind of lotion or makeup— but while driving a car is not one of them. Yes, even talking with your friends can be a big distraction. While it is obviously not necessary to stay silent while driving, if you have a car full of people who are getting too rowdy or you are talking too much, it can be a dangerous situation for all of you. Try to keep it low key while driving, and you are much more likely to get to your destination in one piece.